Conklin Limestone is a family business located in Lincoln, RI. In 1946 the business exclusively sold agricultural limestone.The business was purchased from the Harris family. 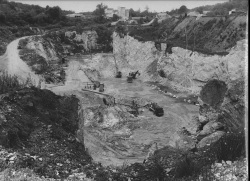 The Harris family was operating the limestone quarry as far back as the 1650's, making our quarry one of the oldest in the country! The limestone in Lincoln, RI is as unique as the Conklin's. Limestone can vary in color from gray to white. The stone found here is some of the whitest stone in the country. When the Harris family ran the show the limestone was cooked in kilns which then created calcium oxide, or lime. Lime is a key ingredient in the process of making cement. Many of the homes built in the early years had stone fireplaces, foundations, and or entire stone walls. Cement is used to mortar the stone together. In the late 1800's kilns were heated by coal or wood. As other methods of heating the lime became more cost effective the kilns were no longer used.The limestone was then used primarily for agricultural purposes as it remains today. More than just limestone...Conklin Limestone is your one stop for all your landscaping needs. Now your Source for all your landscaping and hardscaping needs! Today Conklin Limestone still produces White Line Marker for marking athletic fields, and Lawn & Garden Agriculture limestone. If your looking for a great lawn in 2018, but are feeling the pressure of your wallet, LIME. That's right just lime. We won't be offended if you purchase the pelletized limestone from us. It works well in the rotary spreader that's in your garage. Take the lime challenge this year, and you won't be disappointed. Acid rain, fertilizer, dog urine, are all dropping the soils' pH. If you lime you will bring the pH up and reduce stress to your lawn. Yes, lawns get stressed. Whether it's heat, water, insect, or pH, the lawn will get stressed through out the year. By controlling your pH with lime you are eliminating one stress and your lawn will thank you for it by turning green faster in the spring, and just being more tolerant to the other stresses that are headed our way for 2018. As you can see we are more than just limestone. We sell granite, bluestone, crushed decorative stone, cobblestone, granite fountains, pavers, retaining walls, decorative walls, sand, real stone veneer, cultured stone, ice melter, fertilizer, grass seed, and accessories to accompany them. We work with contractors, homeowners, and design professionals. Bring in your plan, even if it was sketched on the back of your five year old's self portrait. We are here to help. We are Allan Block experts. Bring in your dimensions and leave with a complete estimate of what your wall will cost.